I can't tell you how excited I am for this bit of news: "How To Make Webcomics," is now on sale in the Sheldon Store as a pre-order! Written by myself, Scott Kurtz, Kris Straub and Brad Guigar, the book is being published by Image Comics — and will be available across North America and the English-speaking world in the next 4-5 weeks. Buuut, we're putting the book on sale now as a pre-order, so that we know how many copies to reserve from the publisher's first print-run! This book is the perfect how-to for the next generation of cartoonists who are looking to bring their art online. For years, young, creative men and women have dreamed about making a living from their comic strips. But their only avenue for success was through the slowly dying medium of newspapers. 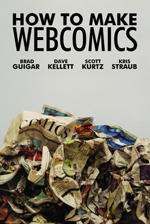 Now, more and more cartoonists are doing it on their own and self-publishing their comics on the Web. This is the book for that generation of artists. Pick up a copy for the artist in your life! Today's a sledge-hammer-and-chisel day for me: I'm in the process of tearing out my old, 1951 yellow-and-puke-green bathroom tile in my house. (By the way, what were they thinking, in 1951? "We won the war! Now let's go home and design ugly tile! 23-Skadoo!"). Let's say, theoretically, that a room is perfectly square. If the initial "impression" of the room will be had from one vantage point (...aka, the door), what's the better direction to lay the planks to create the impression of a larger room, overall? Left-to-right, or front-to-back? I'm curious to hear everyone's opinion. Go ahead and discuss below! *Yep, they can do bamboo in black, now. Looks cool. Now that four or five hundred Glornak stickers have made their way into the world, I'm anxious to hear: Anyone had a good response to them, yet? My guess is that, like most bumper stickers, you wouldn't actually *hear* from the folks who you cracked up... but it'd be fun to see! Post below if you've had a response from friends, family, or strangers!